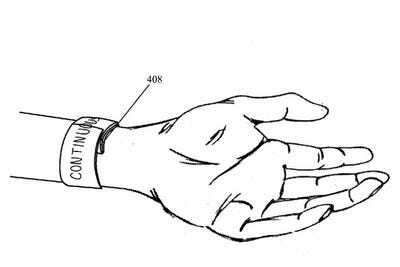 Apple has filed a patent for an iWatch-like device with a flexible touchscreen display, Mikey Campbell of AppleInsider reports. The patent, which Apple filed with the U.S. Patent and Trademark Office in August 2011, is for a “Bi-stable spring with flexible display” that conforms to your wrist or other parts of the body. The device, according to the patent, would have a continuous display and be able to connect with other portable devices, like the iPhone and even more basic handsets, via Bluetooth or Wi-Fi. With the device, users would be able to do things like adjust the order of a playlist, see recent phone calls, and respond to text messages, according to the patent. Speculation regarding the iWatch has heated up recently, and Apple reportedly has 100 people working on a smartwatch. The final product could end up looking very different than what’s shown in the patent filing, but the patent demonstrates that Apple is indeed working on a smartwatch.